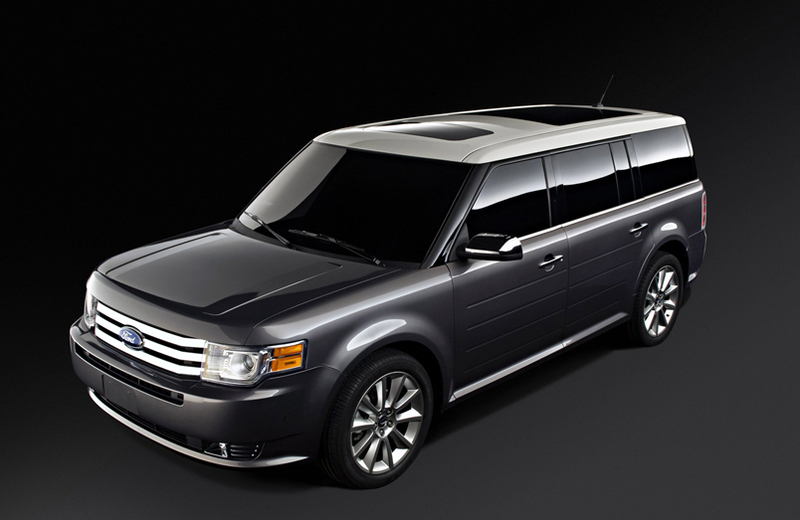 Ford Flex Review: When I first saw the Flex I thought, “That’s a huge MINI Cooper SUV! That’s because it features a similar “floating” cap roof over glass that, for an additional $395, you can order in silver. But the Flex is nothing like a MINI, it carries up to seven people in spacious comfort and is more than 17 feet long. Originally introduced as a concept car, the Flex wears deep grooves along its doors and tail, further emphasizing its horizontality. Ahead of its surprisingly upright windshield is a hood as flat as your dining room table and a nose as vertical as Niagara Falls, only in chrome. It’s strange to think that a vehicle could be so attractive, yet so boxlike, but the Flex is a faceted, 4,800-pound gem. Others agree. Last year, members of the Friends of the National Automotive History Collection (NAHC) voted the Flex as the “Collectible Vehicle of the Future” from the year’s new American-built cars and trucks. The NAHC supports the world-famous automotive collection at the Detroit Public Library. You can get the Flex in three levels: SE, SEL and Limited. Of the many differences, the standard wheel size grows from 17 inches to 18 inches to 19 inches with each level. The base engine for all three is the 3.5-liter Duratec V6 with 262 horsepower through a six-speed automatic. Four-wheel disc brakes with antilock are standard. Inside, climate control keeps you comfy and you’ll find the usual power windows, locks and mirrors, illuminated vanity mirrors on the sun visors, a decent audio system, Ford’s new capless fuel system and much more. The SEL offers chrome accents on the outside, dual-zone climate control, power seats, SIRIUS satellite radio, and Ford’s hands-free SYNC system for entertainment and navigation. The Limited provides even more: a power liftgate, leather seats, wood inlay steering wheel, a 12-speaker Sony sound system, voice-activated Navigation, and ambient lighting. And, it gets the satin aluminum liftgate appliqué. But the big deal, in the SEL and Limited models, is the new Ecoboost engine. Ford claims it supplies V8 performance with V6 fuel economy. That appears to be true. The EPA rates the Ecoboost Flex at 16 City, 22 Highway, and the all-wheel-drive Duratec-powered Flex receives the same ratings. I averaged 17.0 mpg in my typical week of mixed city and freeway motoring. My Dark Ink Blue Metallic SEL test car moved along briskly with the Ecoboost engine. 365 horsepower is a lot compared to the Duratec’s 262. You can feel it when you press the gas pedal and it sounds strong (but not quite as deep as a V8). Direct injection provides a high compression ratio for improved fuel economy and twin turbochargers banish turbo lag, for instant performance. And all Ecoboost models come with all-wheel drive standard. The EPA’s Green Vehicle Guide has no data for the Ecoboost engine yet, but the Duratec earns 7 for Air Pollution and 5 for Greenhouse Gas, and we can all hope that with “Eco” in its name, the new engine does even better. The Flex offers seven-passenger capacity, but my tester had a pair of buckets in the middle seat, making it a six-seater. The second row, with “Autofold”, with the third row’s ability to fold forward or backward provides flexibility in people and cargo hauling. If you’re carrying your precious family around, you’ll appreciate the Flex’s advanced structural safety system. It features octagonal front frame rails, tunnel rails and support members, which absorb and redirect crash forces away from the passenger compartment in a collision. The car’s Side Protection and Cabin Enhancement (SPACE) Architecture provides improved side impact protection. The Personal Safety System analyzes crash circumstances and then controls how the airbags inflate and the seatbelts work, taking into account passenger weight and whether the belts are fastened. The Flex rolls along smoothly and quietly. Ford has sweated the details to get its interiors right, with attractive surfaces, good fit and finish, and supportive seating. The wood trim may be fake, but it’s attractively combined with chrome and silver accents. Interestingly, the Flex, with its standard Electric Power Assist Steering, offers something called Pull-Drift compensation. This software-based technology helps keep the car on track in crosswinds or on uneven roads. It’s standard on Ecoboost-equipped models. Prices start at $29,725 for the SE, including delivery. The SEL starts at $32,525 and the Limited begins at $38,395. Add $1,800 for all-wheel drive. My test car came with a Rapid Spec package, which included 20-inch wheels, the Sony premium audio setup, a “Convenience Package,” trailering package and the silver roof. Total: $41,555. The Flex is part of Ford’s portfolio for the next decade, which will include a new Explorer soon and no minivans. The future looks good from here. The Bottom Line: The 2010 Flex is the new Ford crossover for the next decade. It has the utility of a minivan with the appeal of an SUV. The long body looks like a station wagon with a cool two-toned paint job, while the wide stance assures stability and safety. Toss in the Ecoboost motor and some power upgrades and you have a fine family cruiser for the 21st Century.